There are lots of children on Hill Street, but no little girls Betsy's age. So when a new family moves into the house across the street, Betsy hopes they will have a little girl she can play with. Sure enough, the moment Betsy meets Tacy, one of the most heartfelt friendships in all of children's literature begins. 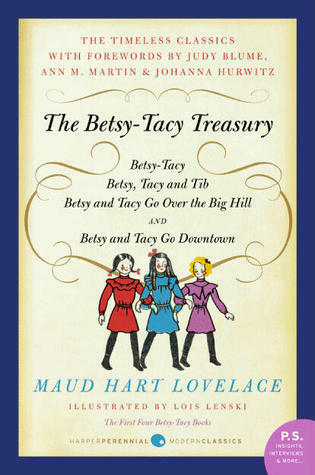 The Betsy-Tacy Treasury brings together the first four books in Maud Hart Lovelace's classic series: Betsy-Tacy; Betsy, Tacy and Tib; Betsy and Tacy Go Over the Big Hill; and Betsy and Tacy Go Downtown. Tracing the girls' lives from early childhood to the brink of adolescence, Lovelace illuminates their innocent, mischievous fun and their eye-opening adventures exploring the world around them - from the stories Betsy spins from their neighborhood bench and the sand stores they run in their backyards, to their first experiences at the library, the thrill of the theater, and the sight of their first automobile. In the very first book of the Betsy-Tacy series, Betsy-Tacy, we meet Betsy Ray and Tacy Kelly of Deep Valley, Minnesota. At five years old, the two little girls form a friendship that will last a lifetime. When Tacy moves in across the street from Betsy, a misunderstanding almost prevents the two from becoming friends. Thankfully, a birthday party is the perfect opportunity for them to get reintroduced. Mischievous Betsy quickly takes the shy Tacy under her wing, and the two become fast friends. One of the best things about these two girls are their imaginations. From turning the piano box into a sand store to cutting paper dolls out of fashion magazines, there's no end to the adventures these two ladies have when they're together. They pretend that they're flying on feathers, that the milk man has a magic talking horse... you name it, they've probably played that game or imagined that scenario. It's such a delight to read about their childish wonder! But it's not always fun and games. When one of them loses a sister and one of them gains one, both little girls are there to comfort each other. Betsy and Tacy understand each other - they know when the other is hurting. And it almost brought tears to my eyes to read about these sweet friends learning how to comfort one another, even at such a young age. This is exactly the kind of book I'd want to give my little girl one day. Betsy and Tacy aren't perfect little angels. They're fun and charming! They chase hens, climb trees, and make up worlds. Best of all, they form a sweet friendship. As an adult re-reading this children's book, I found myself laughing aloud at their antics. The story is easy to read, but it's not simple. It's the perfect foundation for everything to come in this series. The illustrations throughout the book by Lois Lenski are the perfect touch on this adorable read. I spent so much time just flipping back at the drawings - admiring the little scenes depicted and smiling to myself. In the last chapter, Betsy and Tacy meet Tib, a new little girl just their age. The text ends with the words THE END - and right below it is a drawing of all three girls plopped down on the Big Hill bench. Ringleader Betsy and bashful Tacy are back for more adventures, but this time their joined by the straightforward Tib. As we learn in the first chapter, "Betsy loved to think up things to do and Tacy and Tib loved to do them." Now eight years old, these girls get into even more trouble when they've joined forces. One of my favorite chapters is the one where the girls try to learn how to fly. Jumping off items of varying heights, Betsy begins telling a moving story in order to distract her little friends and siblings from the fact that she doesn't want to jump from the tree branches. Right from the beginning of the series, it's a delight to see Betsy master the art of storytelling. She's often leading the other girls into scrapes, including talking them into cutting off much of their hair for a keepsake. Wherever there's mischief, Betsy is sure to be involved. They try to create a club devoted to being good, but it quickly backfires. But it's a scene that made me laugh just picturing it all! Everything about these books seems so realistic, so believable and so charming. I loved that these girls aren't meant to be models of good behavior. These are girls who want to live and have fun, even if it means their dresses get a little dirty in the process. Betsy and Tacy Go Over the Big Hill opens with the three friends approaching their tenth birthdays. For them, it marks a turning point on their way to becoming grown ups. They started thinking of all the things they must do differently at 10, and they're sure they will feel so much older when that day comes. Who can't remember that feeling? When there's a birthday that, in your mind, signifies that you've finally grown up and must put aside your childish interests. My favorite thing about the little episodes in each book is that they feel so familiar - even though they are fictional and were set more than 100 years ago. The title of this book comes from the journey the girls take over the Big Hill. On the other side, they discover "Little Syria." In fictional Deep Valley, there is a large Lebanese immigrant population that has settled and formed their own community. I got a little concerned when the Syrian characters appeared because I wasn't really sure how they were going to be portrayed. Thankfully, this became one of the most surprising and enjoyable aspects of the novel. In one episode, the three girls make a new friend, Naifi, and spend an afternoon with her family. When they later discover group of boys mocking and taunting her, they are quick to jump to her defense because she is their friend. I love when there are moments like this in a book that don't feel like "Lessons," and yet can still teach young readers such important values. Another key plot element in this one is a quarrel between Betsy and her sister, Julia. As the oldest of four siblings, I loved that there was some realistic tension between the two girls. Betsy is torn between her desire to win the argument and her love and admiration for her sister. The anxiety and tension the rift causes is so accurately portrayed that I was clutching the pages just waiting for them to finally work it all out. I also loved the way Mr. and Mrs. Ray try to get them to solve their problems and mend the rift! These are two pretty awesome parents. This is another delightful addition to the Betsy-Tacy series, and readers finally begin to see the girls growing up. They're falling in love, thinking of their beauty, out canvassing for votes and getting a taste of the wide and diverse world around them. It's such a delight to see them coming into their own! Betsy and Tacy Go Downtown (yes, poor Tib never makes it into a title) is the last of the pre-high school Betsy-Tacy books. Now twelve years old, the girls are at that awkward and in between stage of life. Betsy's older sister is flirting and talking to boys, and her younger sister is still playing with dolls. We get to see the girls in that transition between childhood and young adulthood. They're too old for some of their games but too young to care for teenage things. There is a whole new set of adventures to be had in the fourth book of this series - seeing their first automobile, trying to hypnotize their classmate, seeing a play for the first time, performing on stage and a heartwarming family reunion. As before, there is such a great mix of funny and serious moments in this book. One of my favorite things about the series is that Betsy's concerns (even when childish) are never trivialized. But, far and away, there is another element of this book that is my absolute favorite. Mrs. Ray sees how important Betsy's writing is to her, so she gives her daughter her very own desk. There is an aspect to that story that was so touching, but I want you to read it for yourselves. One of the results, however, is that Betsy is allowed to spend every other Saturday at the brand-new library all by herself. She's even given money so that she can get herself some food and stay downtown longer. Betsy's joy at discovering the library and developing her own writing made this book my favorite of the first four. While adults have always had a part in these books, this was one of the first times when we learn a little more about their lives and their stories. In fact, there is a family moment involving Mrs. Ray at the end that absolutely had me tearing up as I turned the pages! It's fun to start to see more of Deep Valley and of the adults at the same time that the girls are finally seeing their world start to broaden. And with that, we're saying goodbye to Betsy's childhood and ready to move into her high school years! Betsy-Tacy: "Betsy was given beautiful presents at that fifth birthday party. [...] But the nicest present she received was not the usual kind of present. It was the present of a friend. It was Tacy." Betsy, Tacy and Tib: "It was strange that Betsy and Tacy and Tib ever did things which grown-ups thought were naughty, for they tried so hard to be good." Betsy and Tacy Go Over the Big Hill: "Betsy and Tacy and Tib found plenty of things to do. They soon stopped being ten years old. But whatever age there were seemed to be exactly the right age for having fun." Betsy and Tacy Go Downtown: "She tried to act as though it were nothing to go to the library alone. But her happiness betrayed her. 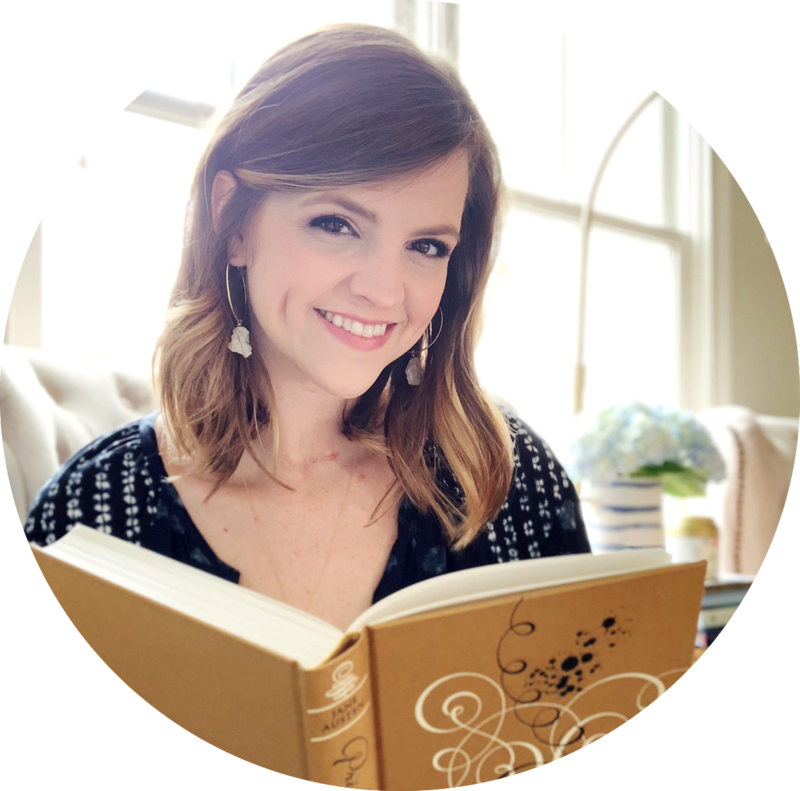 Her smile could not be restrained, and it spread from her tightly pressed mouth, to her round cheeks, almost to the hair ribbons tied in perky bows over her ears." I'm a huge Betsy-Tacy fan. I still have to make the sojourn to Mankato to see the house though. I especially like the high school ones and then the one where Betsy marries. 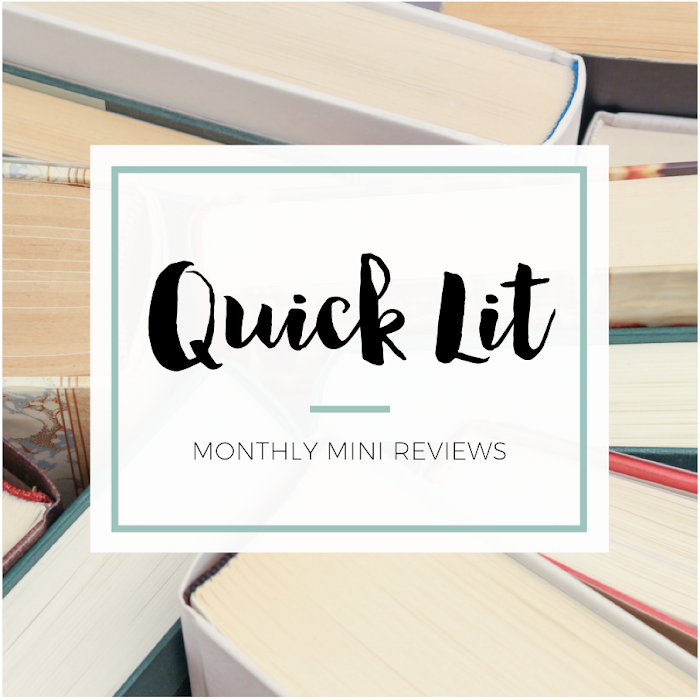 I love that you are a re-reader reviewer on this blog. It makes me think it's time for me to start those and the Anne books again too! Definitely classic childhood reads! The first four books are sweet and fun, but I adore the later books. They've just aged so well and are so incredibly memorable and endearing. Read them, Alexa! I have no idea how to comment on these books because I'm so unfamiliar with them! But I LOVE how much you love them. And I didn't realize how LONG they are! How have I been missing out on these for my entire life? I don't know but you MUST read them soon! And they're so wholesome and awesome so you can totally read them with your girls if you wanted! The original titles were Over the Big Hill and Downtown (the first editions in hard cover, still on my shelves); the change in titles must be a marketing effort to signal the series identity. In a highly competitive book world, this may be necessary, but it seems a pity. Lovelace trusted her readers (and their parents) more. Personally, and this just may be because I'm not as invested in the series' history, but I don't know how the title change really matters or what you mean by Lovelace trusting her readers more. I understand the publisher's desire to make the titles more identifiable with the series. Best children's series ever! I discovered them at age 14 or 15 as a teen living in Florida. I think my sister and I checked the books out over and over! The series continues through Betsy's teen high school years and marriage--they are wonderful. The test of a truly good books is that I can read them now, in my 50's, and they have the same magic as when I was 15! Enjoy. I re-read them all and have to agree! They are definitely magical books, and I'm so happy they were re-issued recently and I was able to add them to my shelves. Can't wait to have kids and hopefully share these books with them! I found these through school book orders in the 80's, and discovered the high school and beyond stories as an adult. I reread them about every six months, and am taking my ten year old Betsy fan for our first Mankato tour this weekend!! At the risk of starting an Anne/Betsy fight, I liked both series as a kid but rereading as an adult, the Anne series doesn't hold up nearly as well. I lost patience with Anne after book 1, who is always so, so good and sweet despite getting into silly scrapes. I enjoy Betsy as much as ever. She has positives and negatives to her personality and just seems so real. I especially love when she goes to France alone. Haha! I love that you're willing to risk an Anne/Betsy fight :) Honestly, I'm torn because Anne will always hold a special place in my heart because I loved them from childhood on and only discovered Betsy in my teens. I just finished re-reading Anne (right before re-reading Betsy), so I do know what you mean. I didn't ever lose patience with Anne - I just wanted more of her in some of the later books and was bored by some of the side stories. I do know what you mean about Anne's flaws mostly being connected to her silly scrapes (instead of negative personality qualities). But I couldn't choose between the two! I JUST LOVE THEM BOTH TOO MUCH. I reread these books at least once a year. They are truly magical to me, and have been now for over 30 years. Yeah, I can definitely tell I'll be re-reading these over the years! I LOVED this series growing up. I read if for the first time in middle school, and over and over from them. Starting high school I remember thinking, I hope my life is like Betsy's. Even when I got married, I asked for forget-me-nots in my bouquet because of Betsy, but when my florist told me they didn't quite work for bouquets, my mom bought be a forget-me-not handkerchief to wrap around them. So I still had forget-me-nots for Betsy on our wedding day.